Suet is composed of beef fat with other ingredients mixed in, such as birdseeds, peanuts and cornmeal, making it a high-energy food and great for birds in cold weather. Attracting birds such as woodpeckers, sapsuckers, orioles, titmice, nuthatches, chickadees, wrens, creepers, kinglets, warblers, catbirds and cardinals, not to mention starlings and house sparrows. Suet can be prepared in the home by melting down beef fat, which can be purchased cheaply at the local grocery store. 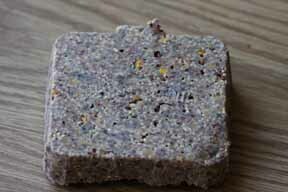 Suet cakes are also available commercially as a store bought item. Homemade suet are more likely to break down and become rancid in warmer weather than the store bought. 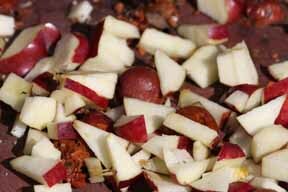 When attracting birds in warmer weather, smaller portions should be put out, as these amounts will be eaten sooner reducing the possibility of spoiling. The beef fats that are not processed into suet can be offered in attracting birds, the birds will be just as pleased. Put it into an onion sack or wire mesh feeder and they will enjoy it as wholeheartedly as if it was a suet cake. There are some birds that are not interested in seeds, but attracting birds with fruit is another alternative. Birds such as the sapsuckers, mockingbirds, pileated woodpeckers, tanagers, thrushes, robins, waxwings (both cedar and bohemian), bluebirds, catbirds, jays, wrens, orioles, pine grosbeaks and the not so favorite starlings enjoy fruit. By putting out pieces of fruit, such as apples, pears, bananas, cherries, oranges or peaches, this will entice these birds to your backyard. Some of these birds are more apt to be seen in spring and summer than others. Fruit seeds such as raisins and currants are a great way to attract birds. It is better to soften the seeds first in warm water then chop them into smaller bite sizes to make them more edible for the birds. 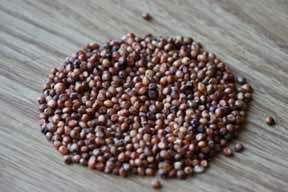 Millet comes in two types, the red and white varieties. Birds seem to favor the white proso millet over the red millet. This small light colored seed is one of the main ingredients in mixed birdseed in attracting birds. Ground-feeding birds, such as doves, juncos, sparrows, thrashers, Carolina wrens, cardinals and our not so favorites, starlings and house sparrows are the more common birds who have a preference for millet. 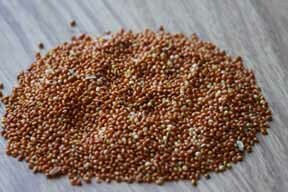 Milo is a large, reddish round seed, also called sorghum. 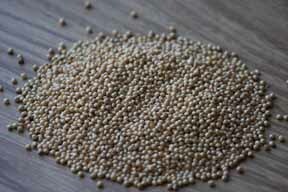 When purchasing birdseed, one should watch for too much milo in the birdseed mix, which is regularly used as a filler. It seems the western birds have more preference for it than the eastern birds, saying that, it is not the preferred choice of birdseed for birds. Attracting birds such as the cardinals, chickadees, jays, juncos, pine grosbeaks and nuthatches not to mention grackles, starlings and cowbirds. Safflower is grown as a crop, its seeds used by early civilization in making dyes and are grown in today's markets for its' oil. Safflower is grown worldwide, surviving in arid regions where other cultivated plants are not able to grow. 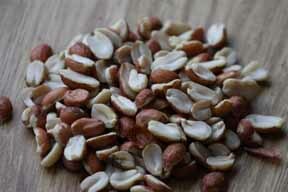 Safflower is a light colored, glossy seed that attracts ground birds such as cardinals, sparrows, grosbeaks and doves. Rumor has it, that safflower is not a choice food for grackles, starlings, house sparrows and squirrels. The safflower seeds and sunflower seeds are used in attracting the same type of birds, but the safflower seeds are more expensive to purchase. Niger, also known as Nyjer or thistle seed, is imported from Africa, where it grows locally as an annual herb, for its edible oil. To prevent the accidental germination of the seeds in North America, the seeds are first sterilized before being allowed entry into other countries. 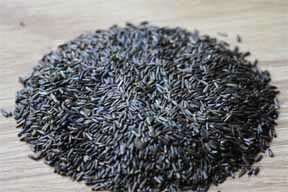 The black-oiled-sunflower seeds are grown commercially for their oils which are pressed from the seeds. Margarine is one of the main products produced from the oils, unlike the white-striped sunflower seeds that produce lower amounts of oil and are grown for human consumption. 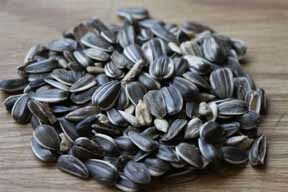 Sunflower seeds are without a doubt, the most popular birdseed among the largest group of bird species. Sunflower seeds come in two types, the smaller variety called the black-oil sunflower seed and the larger variety called the (gray or white) striped sunflower seed. The smaller black-oiled sunflower seed is the overall favorite because of a weaker outer shell casing, which smaller birds have an easier time removing. 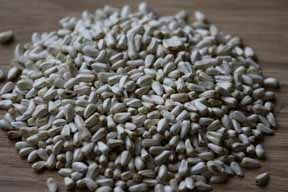 The white-striped sunflower seeds were the earlier variety and the most popular seed before the black-oiled sunflower seeds took over. 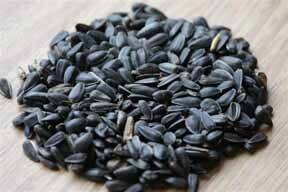 The black-oiled sunflower seed has a higher ratio of meat per seed than the white-striped sunflower seed variety. Attracting birds such as Black-capped Chickadees, Nuthatches, Juncos, Sparrows, Goldfinches, all other finches in general, Grosbeaks, Doves, Cardinals, Woodpeckers and Red-winged Blackbirds, making it the most popular choice of birdseed to offer. The proper name of seeds from sunflowers is called kernels. Dehulled by machines for the purpose of human consumption, either eating the kernels as a whole or by eating foods that the kernels were an ingredient in, such as breads and cakes. 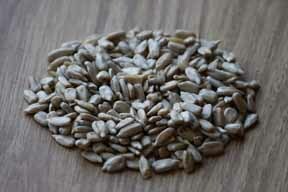 Sunflower hearts and chips (pieces of sunflower hearts) are the most popular birdseed for attracting birds. With sunflower hearts, more birds will be attracted to the bird feeders, even birds that show no interest in sunflower seeds when their shells are on. With sunflower hearts, there are no sunflower seed shell casings to be cleaned up, although comparatively more expensive than the same seeds with shells, because of the time and labour in removing the shell casings. Sunflower hearts must be protected from the weather and stored in a dry and damp free area. These seeds will mould and decompose, if they are exposed to dampness or water. For these reasons, sunflower hearts must be put into waterproof bird feeders, that will keep them dry or be placed in small quantities on a platform feeder, ground or deck during sunny day's, so that all the seeds are eaten by days end. These birdseeds are great for attracting birds such as the grosbeaks, juncos, doves, cardinals, woodpeckers, nuthatches, finches, chickadees, but will also attract types of birds, whose weaker bills are unable to remove the shell casings, such as the thrushes, robins and bluebirds, thrashers, catbirds, mockingbirds, sparrows, goldfinches, redpolls, siskins and Carolina wrens. 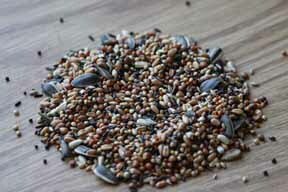 Mixed bird seed is a combination of the more common type of birdseeds available on the market. No bag of mixed birdseed will have the same amounts or type of birdseed as another. One must examine the contents of the bags to recognize the type of birdseeds and the different quantities in them. 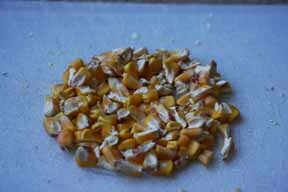 Some mixed birdseed will have more milo and corn, maybe wheat or barley, using these seeds as a filler while others may have higher contents of millet, sunflowers and peanuts. Mixed birdseed can be put into feeders and depending on the type of birds, may discard the seeds they do not like, making feed for the ground-feeding birds such as doves, sparrows, quails, blackbirds, wild turkeys and others who prefer this type of seed. Mixed birdseed can also be thrown over the ground at the base of the feeders and the ground-feeding birds will find it there. 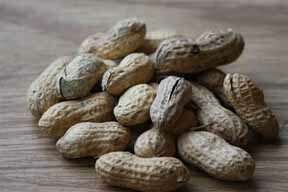 Peanuts are a common bird food in Europe and has only recently been introduced to birds of North America. Although, whole peanuts with their shell can be offered to birds and accepted by a few species, it is better for the birds and easier for most types, if the shells are removed first. Peanuts and peanut chips make great food for chickadees, nuthatches, jays, cardinals, woodpeckers, creepers, sparrows, wrens and titmice, not to mention blackbirds and crows. Peanuts, like sunflower hearts, will mold in damp or wet conditions and for this reason must be stored in a dry and damp free area. It requires special bird feeders, that will allow the peanuts to be accessed by the birds and designed to keep the peanuts dry. Again, just like sunflower hearts, must be given to the birds in small amounts in the warmer summer days, so the peanuts are consumed daily and are not left to mold. Known in other countries as maize, corn is the largest growing crop in North America. There are different varieties of corn, sweet corn is a common food served at the dinner table where as other types are used to feed livestock and grown to produce fuel. Corn is an all around bird food for a large assortment of birds. 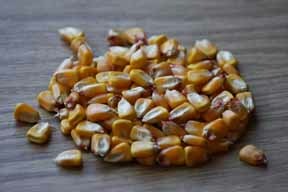 Corn birdseed comes in whole kernels or cracked corn (whole kernels broken into smaller pieces). Cracked corn is the better choice of birdseed which will attract smaller birds, who will be more able to consume it. Corn usually comes in a mixed birdseed composed of other mixtures of millet, milo, sunflower and peanuts. Corn is ideal for attracting birds such as sparrows, finches, quail, doves, pheasants and of course blackbirds, cowbirds, grackles and house sparrows.